When working with color images in Photoshop Elements, you should have an understanding of some fundamental color principles. This will help to make your work in Elements easier when you’re editing color images. Your first level of understanding color is to understand what RGB is and how it comes about. RGB stands for red, green, and blue. These are the primary colors in the computer world. Forget about what you know about primary colors in an analog world; computers see primary colors as RGB. RGB color is divided into color channels. Although you can’t see the individual channels in Photoshop Elements, you still need to understand just a little about color channels. When you see a color pixel (a tiny square), the color is represented as different levels of gray in each channel. When you have a color channel, such as the red channel, and you let all light pass through the channel, you end up with a bright red. If you screen that light a little with a gray filter, you let less light pass through, thereby diluting the red color. Individually, color channels all use different levels of gray that permit up to 256 levels of light to pass through them. When you change the intensity of light in the different channels, you ultimately change the color. Each channel can have up to 256 levels of gray that mask out light. The total number of possibilities for creating color in an RGB model is achieved by multiplying the values for each channel (256 x 256 x 256). The result is more than 16.7 million; that’s the total number of colors a computer monitor can display in RGB color. What’s important is that you know that your work in color is related to RGB images that comprise three different channels. There are 256 levels of gray that can let through or hold back light and change brightness values and color. Another important item to understand about channels is bit depth. A bit holds one of two values; one value is for black, the other for white. When you have 256 levels of gray, you’re working with an 8-bit-per-channel image — 8 bits with two possible values each is 28, or 256, possible levels of gray. Multiply 8 bits per channel times 3 channels (the red, green, and blue channels), and you get 24 bits, which is the common bit depth of images you print on your desktop printer. Now, take a look at the Image→Mode menu. You should see a menu selection that says 8 Bits/Channel. When you open an image in Elements, if this menu command is grayed out, you’re working with a 24-bit image, or an image of 8 bits per channel. When you can choose 8 Bits/Channel, your image bit depth is higher than 8 bits per channel. What does it mean when you can select the 8 Bits/Channel menu command? You can be certain that your image isn’t an 8-bit-per-channel image. You may be able to select this command because some digital cameras and most low-end, consumer-grade scanners can capture images at higher bit depths. You can scan a photo on a scanner at 16 bits per channel. When you do, you end up with many more levels of gray. When you take a picture with a quality digital camera, you can capture 16-bit-per-channel images, and you end up with a file containing more than 4,000 levels of gray. Now, here’s the catch. All files need to be reduced to 8 bits per channel before you print them because that’s all the information any printer uses. In addition, many tools, commands, and panel options work only with 8-bit-per-channel images. If you attempt to adjust brightness and contrast, or other image enhancements, in an 8-bit-per-channel image, you often destroy some data. You can cause some noticeable image degradation if you move adjustment sliders too far while working with 8-bit-per-channel images. 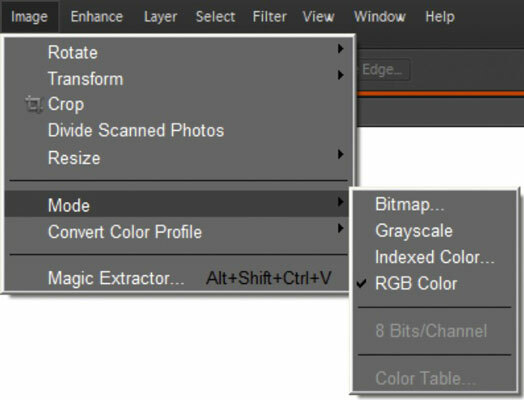 When you edit your 16-bit and 32-bit images, you don’t destroy data — you simply inform Elements which 256 of the total available levels of gray you want to use. The result is an image with more continuous gray tones than you can achieve in 8-bit-per-channel images.